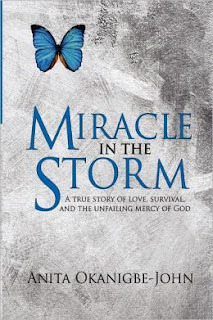 Today I am honored to be hosting my friend and author Anita Okanigbe-John and to introduce her debut novel, Miracle in the Storm. I started writing inspirational quotes since my high school days. In 2011, I published my first book. I write because I believe that I have a message for the world and my books would be able to reach millions of people I can’t get to. In 2008, I knew without a shadow of doubt that I wanted to become a writer and I began to write short motivational stories. Yes, I have. Usually, I would pray and draw inspiration from nature – birds singing, river flowing, gardens, trees, sky, and anywhere nature is at its best. I think out aloud then type what I thought on the computer and modify it until it becomes perfect (while at it, I must have something to snack on). I wanted to become a musician or an Actress. 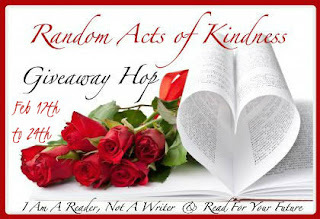 Watch out for my blogspot and my new books! As the seventh daughter, Igho is rejected at birth by her father who desperately wanted a boy. At age eight, she is molested by her father's laundry man. Constantly being punished for crimes she did not commit, she secretly begins to long for a better home. Igho goes to live with her elder sister but soon begins to suffer domestic abuse from sister and sexual harassment from her sister's husband. Due to the psychological trauma resulting from the abuse, Igho drops out of high school and runs away from home at age seventeen. She begins to live on the street begging strangers for food, shelter and money. With the help of a youth Pastor, she finds a new home and gains admission into the university where she graduates with a second class upper degree. 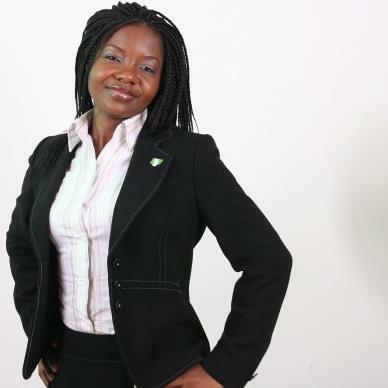 After two years of paid employment, Igho resigns from her job to start her own business. Now Igho has a business that is becoming a brand to reckon with and a ministry to help youths overcome their painful past. Anita is currently the CEO of Apex-Laurel Limited. A graduate of International Law & Diplomacy, Babcock University, Nigeria and Masters in Human Resource Management & Business, Aston Business School, United Kingdom. She is an Author, Speaker, Performance coach and a member of the Chartered Institute of Personnel and Development (CIPD). Her passion is supporting the underprivileged to gain control of their lives through education and making positive impact in the lives millions of abuse victims all over the world. She lives in Birmingham, United Kingdom. 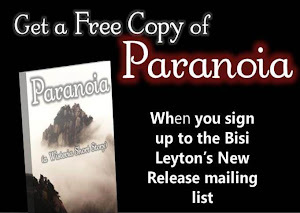 Please leave a comment below about the interview and leave a sign up for the Bisi Leyton Mailing List for a chance to win a copy of my latest novella Criteria. I signed up for the mailing list & I love that quote. Wow! powerful looking book, reminds me a bit of The Darkest Child. Loved the interview too. Thanks for the giveaway! I signed up for the newsletter.